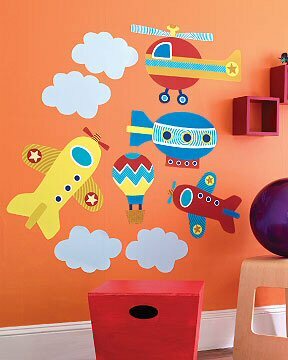 Transform your child's room into a world of high flying fun with these creative Up, Up, and Away Wallies Big Mural Wallpaper Cutouts. Each piece is diecut for easy use, and with the helicopter alone almost 2 feet wide, this sky transportation mural set is a fun, fast, and easy way to transform a room on a budget. 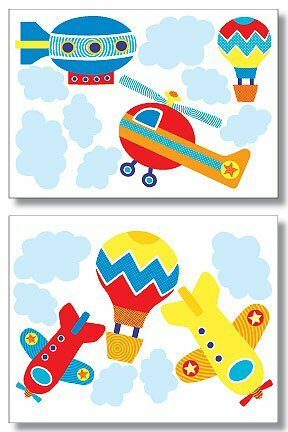 Making it easy to achieve the look of stenciling, these fun Up, Up, and Away Wallies Big Mural Wallpaper Cutouts will delight the little aviator in your life. Clouds 8.25" x 5.875" to 11.375" x 8.375"; Helicopter 22" x 14.25"; Blimp 17.375" x 10"; Planes 12.375" x 15.25" to 16.25" x 19.75"; Hot Air Balloons 7.875" x 12.375" to 12.25" x 19.125"
Create a fun and festive atmosphere in any room with this customizable Small 3 Round Balloon Cluster fabric wall art.